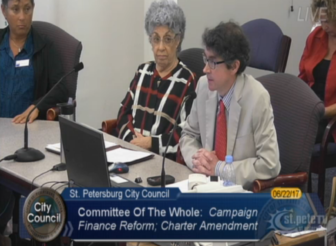 St. Petersburg City Council votes to move forward a model law to abolish super PACs and limit foreign corporate money in local elections. ST. PETERSBURG, FL – The St. Petersburg City Council voted today to move forward an ordinance that will abolish super PACs and prohibit spending by foreign-influenced corporations in city elections. The ordinance is the first of its kind in the nation. “Campaign spending reform will not come from Washington or Tallahassee. If we are going to stop the tidal wave super PAC money, it will have to start with Cities brave enough to challenge it,” says Karl Nurse, St Petersburg Councilmember. In March 2010, the U.S. Court of Appeals for the D.C. Circuit in SpeechNow.org v. FEC opened the door to super PACs by holding that the federal law limiting contributions to political committees to $5,000 per person each year did not apply to a political committee that promised to make only “independent expenditures.” While some federal appellate circuits have followed the SpeechNow ruling, the U.S. Court of Appeals for the Eleventh Circuit, which has jurisdiction over federal cases in Alabama, Florida, and Georgia, has yet to rule on this question, nor has the U.S. Supreme Court or the Florida Supreme Court. Alongside the rise of super PACs, the nation has also witnessed foreign corporate money flowing into our elections as a result of the U.S. Supreme Court’s 2010 ruling in Citizens United v. FEC, which swept away longstanding precedent barring corporate money in our political process. For example, in May 2016, Uber teamed up with fellow ride-hailing service Lyft to drench Austin, Texas, in $9 million worth of election spending in the hope of overturning a city law requiring drivers to submit to fingerprint-based criminal background checks. Then, just weeks later, Uber disclosed an unprecedented $3.5 billion investment from the Saudi Arabian government, meaning that the Kingdom owns more than five percent of the company, along with a seat on its board of directors. And, in 2014, Chevron spent over $3 million backing city council and mayoral candidates in Richmond, Calif., a city half the size of St. Petersburg. Chevron — a multinational corporation whose stock ownership changes by the minute — was at the time facing a multimillion-dollar lawsuit from the city over a refinery fire that caused more than 15,000 people to seek medical treatment. Free Speech For People, a national non-profit public interest organization founded on the day of the Supreme Court’s Citizens United ruling, helped to draft the ordinance.